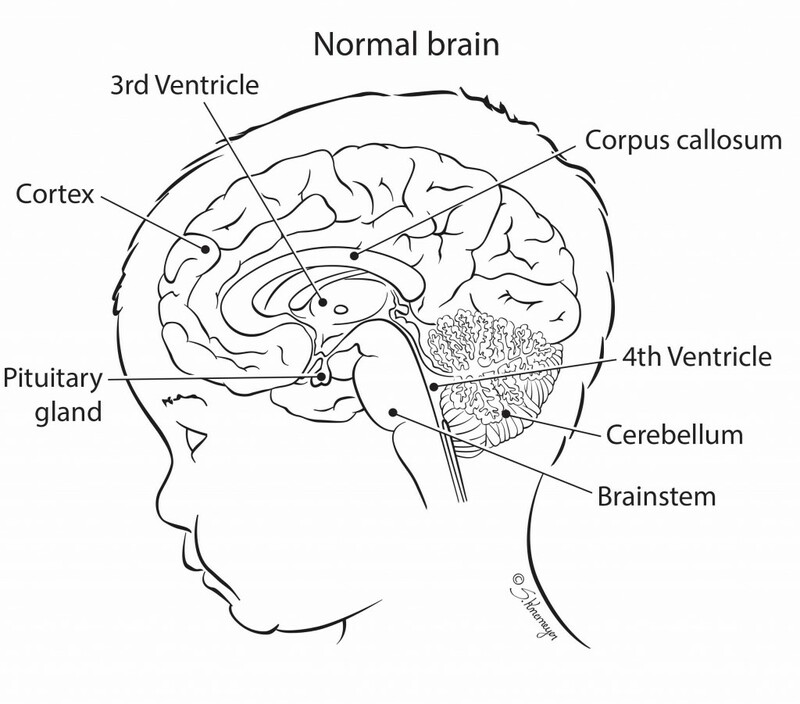 Agenesis of the corpus callosum (ACC) is a rare, congenital (existing at birth) brain defect where a structure called the corpus callosum does not develop normally. The corpus callosum is a band of tissue connecting the left and right sides of the brain. It is made up of nerve fibers that send information between the two sides of the brain. 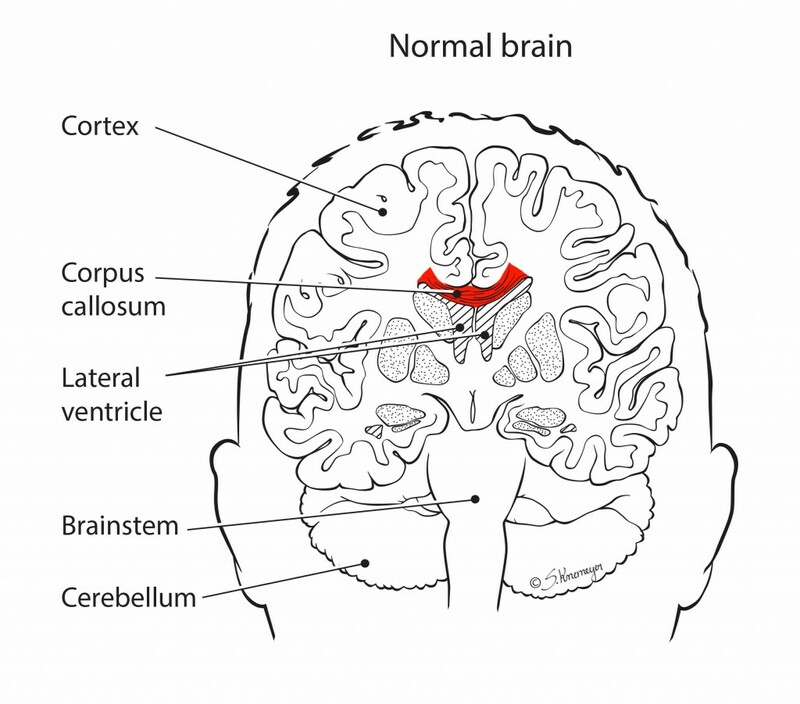 Problems during development of the corpus callosum can range from underdevelopment, where there are fewer than normal numbers of fibers connecting the two sides of the brain (partial agenesis) to the complete absence all connections (complete agenesis). ACC can occur by itself, or with other types of genetic syndromes and disorders. The severity of the symptoms due to ACC is highly variable. Some children with ACC will have developmental and physical problems that will require lifelong medical care, and may require surgery. Other children will have normal intelligence with only mild neurologic problems and should lead normal lives. Sometimes symptoms aren’t noticed until adulthood. All babies with ACC can benefit from physical and occupational therapy. Early intervention and support is critical to helping these children reach their full potential. Sometimes no cause for ACC can be found. Ultrasound. An ultrasound can sometimes detect problems in a baby’s developing brain. MRI (magnetic resonance imaging): This type of imaging gives more detailed pictures of the fetus’s brain, spine and organs. Amniocentesis. A small sample of the amniotic fluid surrounding the baby in the womb is taken and tested for chromosomal or genetic problems. Milder forms of ACC may not be found until later childhood or even the teen years, when learning problems may become clearer. In rare cases, there have been adults identified with undiagnosed ACC. If a test finds you are carrying a baby with ACC, you will continue to receive care from your doctor. You may be referred to the Ohio Fetal Medicine Collaborative (OFMC), which will help you connect with a team of experts at the Fetal Medicine Clinic at Nationwide Children’s Hospital. At Nationwide Children’s you may also meet with a multidisciplinary team including neonatologists (doctors who specialize in treating newborns), neurosurgeons (doctors who perform brain surgery), neurologists (doctors who specializes in brain) and nurses to learn more about your baby’s care after he or she is born. Nurse coordinators will help answer your questions and concerns, guide you through your pregnancy, and prepare you for what to expect. Your doctor will watch your pregnancy closely, and will deliver your baby at a hospital that is prepared to care for high-risk babies. Contact your doctor if you ever have any concerns. Your baby may be transferred to the NICU at the Main Campus of Nationwide Children’s Hospital for further care. It is very important for your baby to have a follow up appointment with the pediatric neurologist for a complete evaluation. Your baby will need regular follow-up appointments to measure growth, development, and nutrition. You will want to find a local pediatrician to take care of the routine checkups, immunizations, and doctor’s visits. The NCH program coordinator can help if needed. Most parents who have one child with ACC do not have another with the condition. However, your doctor may recommend genetic counseling to discuss risks for a future pregnancy because ACC can be related to inherited disorders. Care for children born with ACC focuses on preventing medical problems and maximizing the child’s abilities. Physical and occupational therapy and early intervention are important in helping your child develop mentally, physically and socially. The best results happen when these interventions continue through childhood and into adulthood.